Did you know that the bathroom is often overlooked when homeowners make remodeling plans? There are so many opportunities available to you to transform your bathroom into an oasis from the outside world. 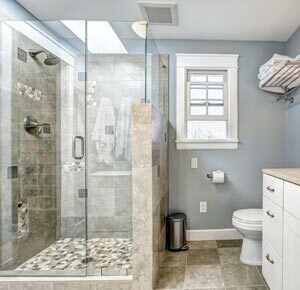 We have experience in both small bathroom remodels and more extensive home improvement projects. Yellowed bathroom tile can make your bathroom look old and dated. Refresh the look of your bathroom flooring with beautifully designed ceramic tile, vinyl, granite, or even marble. Our Portage bathroom remodeling designers can help you find the best look for your bathroom. You can also choose to update the look of your bathroom vanities, sinks, tubs, showers, or toilets. Bathroom remodels add value to your home whether you are looking to sell your home in the near future, or you want to stay in your home for the next decade. Our experienced bathroom remodelers can help you generate bathroom remodel ideas that are both practical and beautiful for your home. If you are interested in our Portage bathroom remodeling service, please contact our bathroom remodeling contractors at (269) 329-1800. At Abode Building Center, our bathroom designers want to help you get the most out of your bathroom space.